Art begets art, or at least that’s the operating principal behind the Northampton Arts Council's Four Sundays in February series. The four part series features exceptional local and national talent, while proceeds from the performances help fund the Council’s spring grant round, providing needed resources for both emerging and established Pioneer Valley artists. With the opening of the Council’s spring grant round on April 15, artists are invited to take advantage of this year’s Four Sundays’ returns by applying for grants to fund their projects, to connect with other artists, and to make more art. Four Sundays was first launched in 1993 and since its inception, the festival has been framed by two beloved Northampton traditions: The Silver Chord Bowl and the Really Big Show. Silver Chord Bowl is a showcase of collegiate a cappella talent from across the northeast, opening with a set from Northampton High School’s own Northamptones who hold their own against the more seasoned singers. The Really Big Show, which in recent years has featured a second act dubbed “The Really Big Gong Show,” complete with all the props associated with its 70s namesake, is a local variety show and every year, the show’s audience finds itself amazed, moved, and amused by the variety of local talent. Under the leadership of current and former Arts Council staff, including current director Brian Foote, and events coordinator Steve Sanderson, Four Sundays has brought diverse, inventive acts to round out Four Sundays’ calendar. 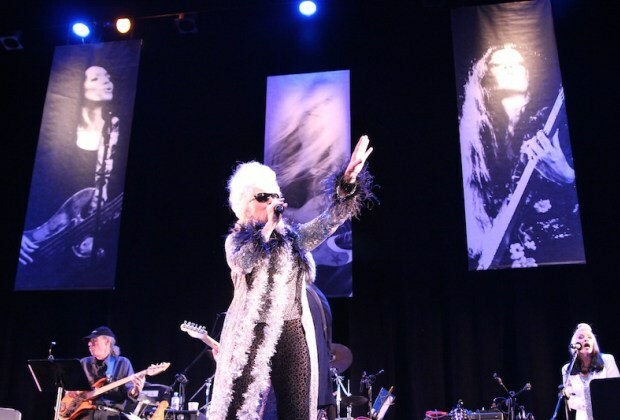 This year saw the nationally recognized Alloy Orchestra proving a live soundtrack to Rudolph Valentino’s Son of a Sheik, and a sold-out tribute to June Millington, the legendary punk rock icon and founder of Goshen’s Institute of Musical Arts. Proceeds from Four Sundays’ ticket sales and program advertisements give the Northampton Arts Council the resources to fund the spring grant rounds for Pioneer Valley artists, launching many projects that would otherwise never get off the ground. Rachel Stratham, a local writer and poet, applied for and received a grant in spring 2015 to create her online magazine, MISTRESS, and hold a public poetry reading. “I probably wouldn’t have started MISTRESS without that grant,” says Stratham. “We didn’t have any means,” she notes, other than pulling from her own pocket, an option that most young artists simply can’t afford. Long-standing Valley traditions also turn to the council for funds to enhance their offerings. Paul Arslanian, a lecturer and dance accompanist at the University of Massachusetts and organizer of the Northampton Jazz Festival, applied for a grant in spring 2015 to expand the Northampton Jazz Workshop. Found in 2010, the workshop brings local and national jazz musicians together for improvisational sessions. With the money from the Northampton Arts Council, Arslanian was able to bring even bigger talent, such as Grammy award winning vocalist Karrin Allyson, and revered saxophonist Houston Person, to play with Arslanian’s Green Street Trio before packed houses. Featured image by Gabe Bernini/Paradise City Press.